*for Drawings please visit the MRU Product Page. You need this if you are using our CD and HPS Series clutches. The air needs to be introduced to the clutch from a stationary supply source, and delivered to the modules which are rotating with the mounting shaft. There are other applications where it is necessary to provide a constant (or variable) air supply to a rotating unit. A turret unwind stand comes to mind, but these usually use a larger size rotary union, but it is conceivable that the micro size could be used. Can this be used with any Montalvo Brake and Controller? Yes, it can be used with any Montalvo controller. Again, we normally use this for our clutches only, but you can use any controller and IP converter combination. How does the MRU work? The MRU Micro Rotary Union is a mechanical stationary device that allows the transfer of air to and from rotating equipment. 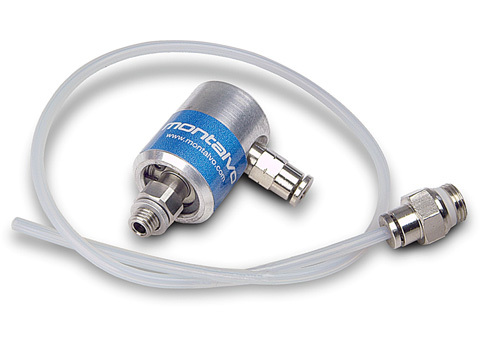 The MRU is designed to provide constant air flow and cooling and can endure varying ranges of temperature and pressure.